Essential for child devices and optional for parent devices. For Android devices only. Looking for iOS? Go here. Need help getting started? Here’s a simple how-to article to get started. *Not available on Google Play. Our Full Feature Version is available only via this download page and essential for your child’s Android smartphone. Our Google Play version no longer includes two key permissions, Calls and SMS, required to allow our Call and Text Message monitoring features on Android smartphones. Our Full Feature Version continues to offer the same full features. Get in touch with our support team who will gladly help you. Why can't the Call and SMS features be offered via Google Play anymore? Google’s announcement in late 2018 around protecting user’s data privacy was sent to its app developers stated that “Going forward, Google Play will limit which apps are allowed to ask for these permissions. Only an app that has been selected as a user’s default app for making calls or text messages will be able to access call logs and SMS, respectively.” We worked hard at trying to convince Google that due to the safety nature of our features based on the Call/SMS permissions, an exemption should be granted but months of trying and even leveraging the voice of our many users didn’t make Google budge at all this. This is why we are offering this offline version which continues to offer the same great feature set our users love. Do I install in my parent device or child device? We recommend all child smartphones get this version installed. For our parent mode it’s less important as it can still control this version. You can install this version on all family devices. After updating from the Google Play version, do I need to do anything else? 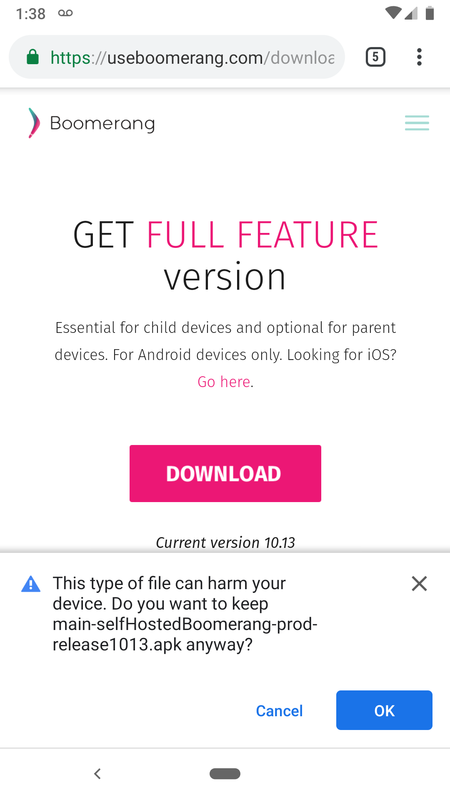 We recommend you restart your child’s device after updating from the Google Play version to our sideloaded version. This makes sure our service is refreshed and running smoothly. Version 10.37 (April 2019) no longer allows the Google Play version to update the sideloaded version. This eliminates losing the call/text features due to your child manually updating their apps, including Boomerang Parental Control via Google Play. All future updates will be made available from this web page. 3. Later, we will look to add our own update service so we can notify within our app and update automatically for any “sideloaded” versions. I received a warning “This type of file can harm your device”. Is it safe to tap OK? What does "gp" and "sideload" mean? Our support team is amazing. Get in touch! Discover answers to many common scenarios here.